CEG's Business Process Management (BPM) Programs are created and delivered by BPTrends Associates (BPTA), a global pioneer and leader in business process management. Developed for anyone interested in business process improvement, the curriculum is designed for serious business managers, business analysts, and practitioners involved in process-based change and implementation of process solutions. The BPM Curriculum establishes a consistent, integrated and scalable BPM Methodology, including a common language and common tools and techniques, which will assure efficient collaboration among all process practitioners within an organization. Join the elite group of process practitioners and certificate holders who can successfully align processes with business strategy and organizational goals. Make certain that you — and your team — are trained in the most comprehensive, integrated and scalable Business Process Management methodology and training curriculum available. The Business Process Professional and Advanced Professional curricula focus primarily on process change projects. They provide the skills needed to redesign specific processes. The Business Process Architecture curriculum focuses on developing an enterprise-wide understanding of an organization’s processes, developing a business process architecture, aligning process measures and establishing a process governance system and CoE. Curriculum is recognized by the International Institute of Business Analysis (IIBA®), the Association of Business Process Management Professionals™ (ABPMP™) and the Object Management Group™ (OMG™). The BPTA BPM Training Curriculum is based on the BPTA BPM Methodology, and is the most comprehensive, integrated and scalable BPM Methodology and Curriculum available today. 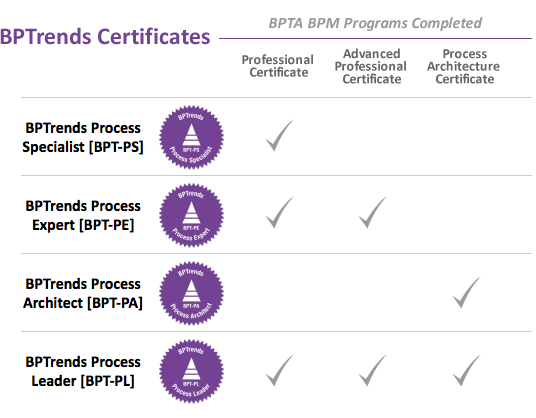 The BPTA BPM Professional and Advanced Professional curricula are focused on the activities depicted at the Process Level (above). 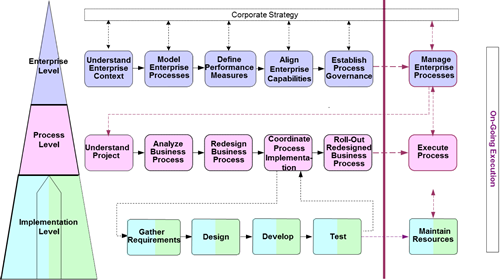 The Business Process Architecture curriculum is focused on the activities depicted at the Enterprise Level (above). The entire courseware has been newly revised and updated based on current market research, feedback from BPM thought leaders, and BPTA's global partners and clients in the international BPM community. Upon the successful completion of any or all of the three BPTA BPM Programs, participants now have the option to take the corresponding BPT BPM certificate exams and to earn one or all four of the BPT BPM Credentials. You can also earn a BPM Certificate through CEG's alliance with Duke University to build professional credibility from a renowned higher-education institution. Participants who opt for any of the three CEG/Duke University Management Training Business Process Management Programs are required to pass an exam at the end of each classroom session to successfully complete the program.